Home › Components › Accessories › Misc. Choose from a wide selection of accessories to complement and customize your Keyport Slide. Miniature quick-release clip that enables you to easily attach loose items to your Keyport. Works great with the spinner end cap. Nite Ize dual spring gate, plastic S-Biner (Size #0) made of lightweight glass filled nylon, is excellent for securing key fobs and other loose items to your Keyport or for attaching your Keyport to a zipper, bag, backpack, or belt loop. The Nite Ize S-Biner MicroLock is the perfect size to connecting an auto fob or other loose items to your Keyport. With its added twist lever, it locks securely, preventing any unintended or accidental openings. 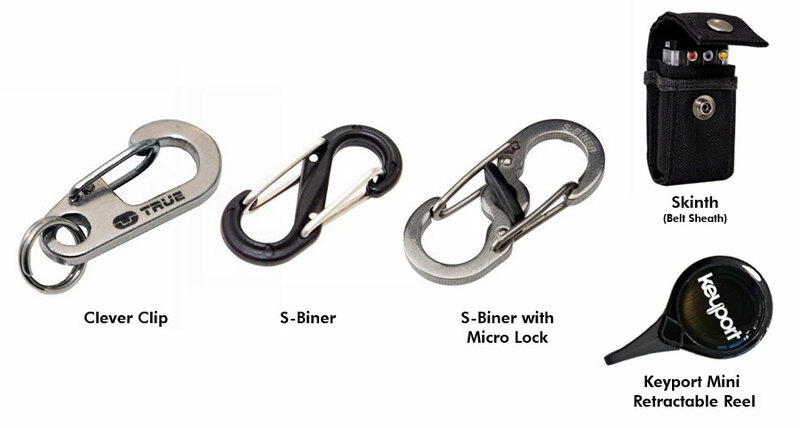 Made of high quality stainless steel, the S-Biner MicroLock features a center lever made of durable plastic--a simple twist effectively and securely locks the gates, and keeps them that way until you twist it open again. This heavy-duty retractable reel with a spring-loaded cord is perfect for clipping your Keyport to a belt, backpack, or purse giving you easy access whenever you need it. Carry your Keyport Slide V.01 or 2.0 on your belt with this custom made Skinth sheath.